Hi to everyone. I am new to this forum... but not to drumming... I have played on and off for many years. In fact in 1997 a bought a Toca conga. I just recently pulled it out of storage, dusted it off, and started playing again. I've been watching youtube videos and trying to develop some consistent patterns. Which all leads to my question: I do not know what drum I have! I would like to find out (if anyone can help.) I am looking to buy a second drum... if I can find one that is a good match... maybe a matching used drum from the same year if possible! 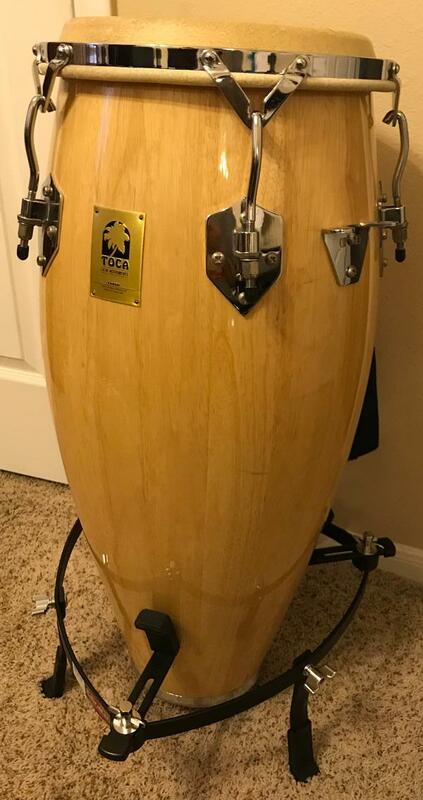 So here are the specs: It is a Toca, stands 30" tall, weighs 25 pounds, has a "traditional" five lug tuning hoop, has a handle and stand hardware attached. The head measures 11" across the playing surface. The opening at the bottom has a diameter of 5 3/8". I'm thinking it is a Quinto but I really don't know for sure. I also don't know what model or series it is, although it looks like what they now call the "Traditional" series, but with five lugs... not six like they sell today. I have attached some pictures. If anyone is familiar with this model please let me know. I would like to add a drum that is one size larger to get some low tones. Thanks for looking. I have more pictures if anyone asks. 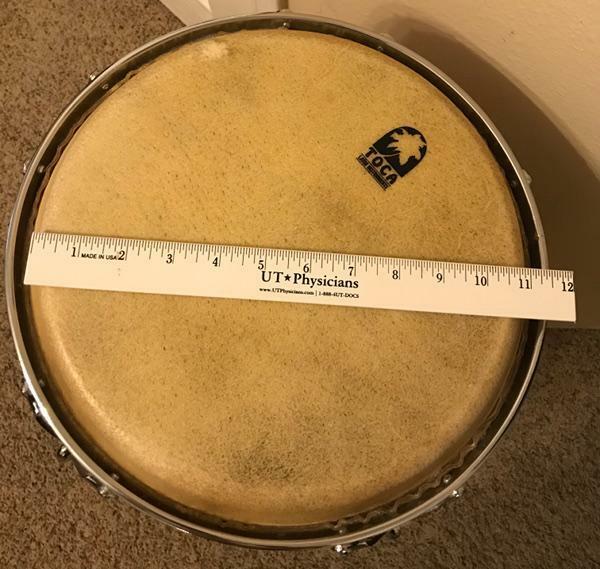 Still interested in confirming the model of my 20-year-old 11"-head Toca... if anyone knows the history. I can't tell you anything about Toca (except that the late Angá played this brand), because I never played nor saw one in my life. Most modern brands and builders state an 11" drum is a quinto. So if you've got the matching tumba, it should be fine. Many drummers use a quinto and a tumba, without tres dos. So if you can tune your drums correctly, you should be satisfied with them. Meanwhile... i plan on tuning the 11” (call it the Quinto) to about middle C and the Tumba to around G below. I know it will sound great. So now... back to playing...!!! 11" is best used as a Quinto, but you can also tune it to a Conga to match your newly acquired Tumba. I would not get to hung up about as it is more about what rhythm or genre you are playing.